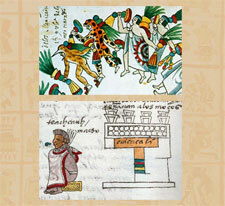 Among the Aztecs music, song, and dance played a very important role. Centuries before the European conquest flourished a rich music culture in the Aztec capital Tenochtitlan and the centres of neighbouring kingships in the Valley of Mexico and beyond. Aztec musical thought was of a high philosophical level. Musical sounds, song and dance movements were of religious meaning and often accompanied ritual acts, such as offerings and sacrifices. Music and dance were understood as a sacrificial gift to the gods. Interestingly, there was no Aztec word for music. 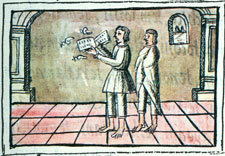 Music was the “art of song” (cuicatlamatiliztli) and musicians did not play but “sang” on their instruments. To dance was “to sing with the feet”. Musical practice flourished among various groups of the Aztec society. 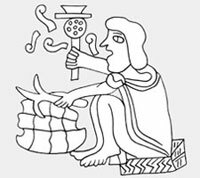 There was music performed by the commoners in each household and in local township festivities, but also in certain ceremonies in the heart of the Aztec temple precinct, such as in the “sowing of the rattles” (ayacachpixollo). The commoners had various kinds of rattles and small whistles, which were used in household worship. A group of old men, which were the leaders of the local townships, played drums. Different whistles were used by the hunters to attract game. Within the Aztec temple precinct music was performed by priests, who cared for the musical worship of the gods in sacred courtyards and on top of the pyramids. They sounded trumpets during sacrifices and to announce the times of penance, large rattle-sticks and rattling incense ladles in processions, slit-drums during nightly rituals accompanying astronomical observations on top of the temples, turtle shells, gourd rattles, and bone rasps in ceremonies of grief, flutes, whistles, and many other instruments. There were also sacred temple chants directed towards the deities and temple dances performed by priests and the representatives of the gods, who carried metal bells and conch tinkles as part of the ritual garment. As part of the large ceremonies held every 20 days, theatrical performances of mythological or historical content and ritual games were performed. Unfortunately, not much information is present on the role that music played in the ritual ballgame. According to archaeological finds, eagle whistles, small flutes, ceramic drums, and slit-drums were used. 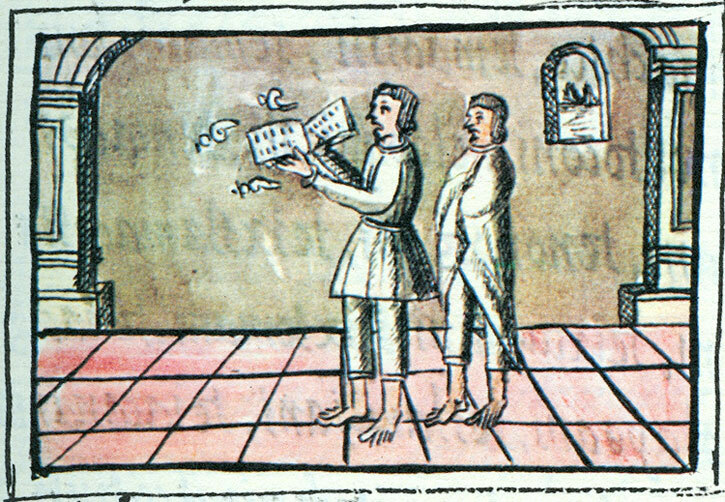 Apart from the music of the priests, there was a court music performed by professional musicians and singers, who resided in the palace of the Aztec ruler, in a place called the “house of the Cloud Serpent” (mixcoacalli). The court musicians performed the music of large circular dances, in which often hundreds of dancers took part. They also played for their ruler, such as during daily banquets, which were accompanied by acrobats and dwarfs, and were ordered to play for the wealthy merchants in their private feasts. 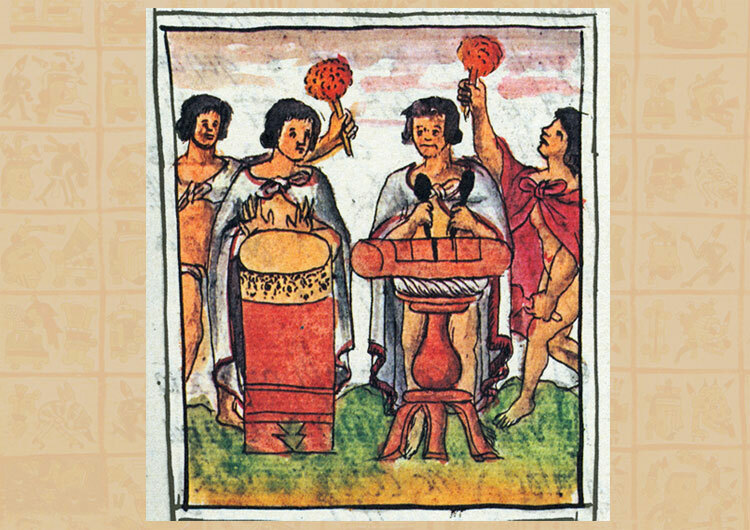 Some court musicians were among the best singers of the Aztec empire. They were famous for performing the regional chants and dances of conquered cultures. A talented high ranking group of the court musicians was responsible for the composition and instrumentation of new chants and dances in honour of the ruler. The sacred hymns referred to mythological events and to historical records, such as conquering battles or dynastic marriages. For their music, the court musicians employed ensembles covering all kinds of musical instruments. 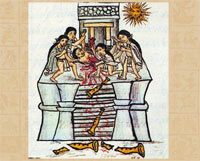 Additionally, music played a very important role among the Aztec warriors of the eagle and jaguar societies. These groups of noble warriors gathered in the so-called “house of song” (cuicacalli), a building near the palace, to practice dances and songs, which were performed in the ceremonies of the sacred temple precinct. In this building, which had a huge courtyard for singing and dancing, also the youths of the commoners were carefully trained in musical practice. In battle, the eagle and jaguar warriors made a frightening noise with shell trumpets and whistles and gave drum signals during attacks to direct the movements of the troops. In ceremonial circular dances they played on high-pitched whistles. Musical instruments were precious objects, which were stored in the temple sanctuaries and in the palace. 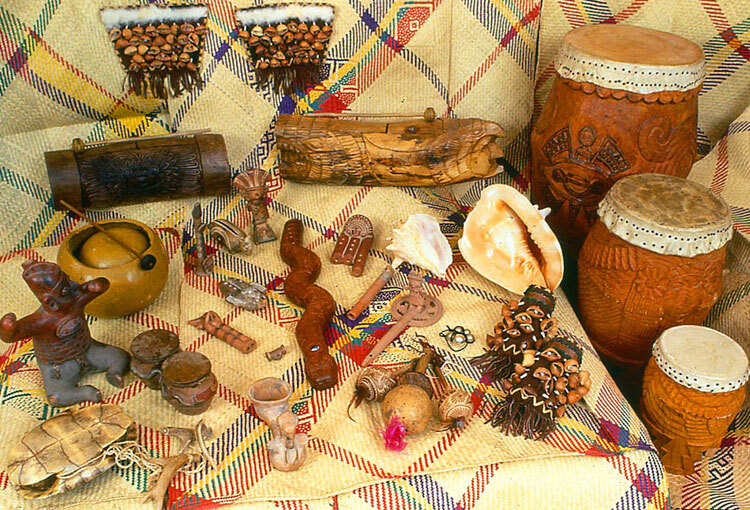 The temple and the court musicians employed instruments made from the most precious materials obtained from long distances, such as fine woods and jaguar skins for the wooden drums, gold and copper for bells, or marine shells for rattles and trumpets. Some musical instruments were regarded as sacred objects and adored on altars and small shrines, the so-called Red Temples. On top of these altars were placed the statues of the Aztec gods of music, “Prince of the Flowers” (Xochipilli) and “Five-Flower” (Macuilxochitl). 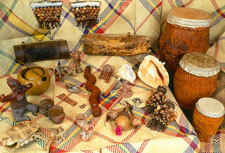 Musical instruments were highly valued because their ritual sound was considered to be the voice of the gods. Aztec priests fulfilled the role of expert mediators through whom a god sang. Thus, music and sound functioned as a means of communication with the spiritual realm, such as the sweet scent of copal. With specific sounds and in ecstatic dance, communication with the world of the gods was achieved. 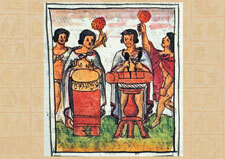 Some musical instruments played an important role in myth, such as huehuetl and teponaztli, who were considered the former court singers of the sun and manifested on earth as the skin drum and the slit-drum. 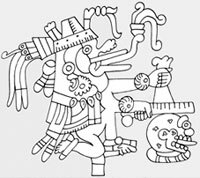 Interestingly, extant drums often show the imagery of the Aztec gods of music. 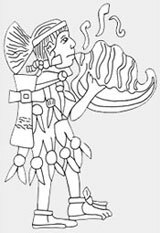 With another important musical instrument, the shell trumpet, the god Quetzalcoatl produced the primordial blast in the underworld heralding the creation of humankind. 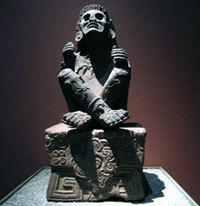 The sound of ceramic flutes, on the other hand, was related to the god Tezcatlipoca, “Smoking Mirror”. 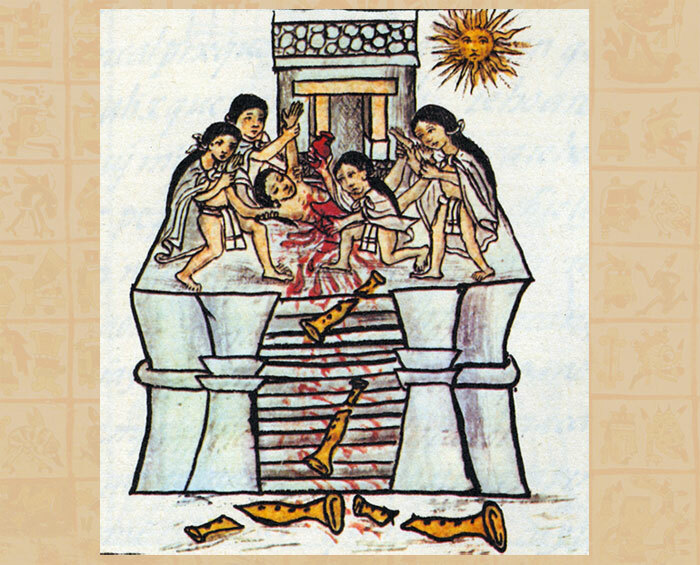 This is a list of the musical instruments of the Aztecs. 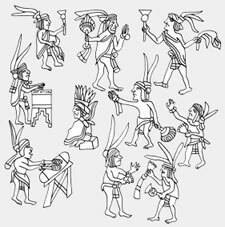 According to the Aztec classification, all instrumentalists were divided into percussionists or “beaters” and wind players or “blowers”. Each musician was named for the instrument he played, for instance, “drum beater” or “shell trumpet blower”. Musical instruments were also classified according to the symbolism of the material they were produced from, their sound characteristics and sound symbolism, and their mythological meaning. • huehuetl, tlalpanhuehuetl - Sculptured and painted cylindrical drums with three stepped legs made of the wood of the swamp cypress. There was a smaller and a larger type. These and other skin drums were covered with deer, coyote, ocelot or jaguar hides and beaten with the palms of the hands. • xochihuehuetl - Different types of ceramic drums. • teocuitlahuehuetl �“ A small metal drum made of gold. 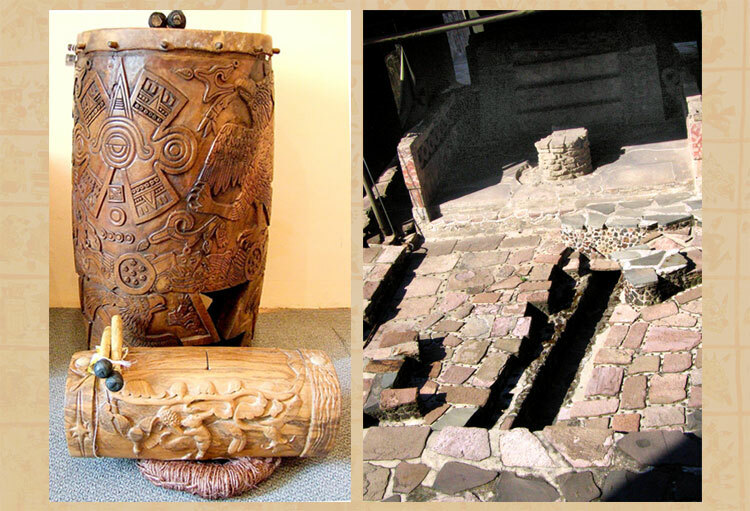 • teponaztli - Sculptured slit-drums made of hardwoods, which were beaten with two gum resin covered wooden mallets called “rubber hands” (olmaitl). For a better resonance, these instruments rested on a ring called a “throne” (icpalli) in temple rituals, and on a X-shaped wooden stand in ceremonial dances. 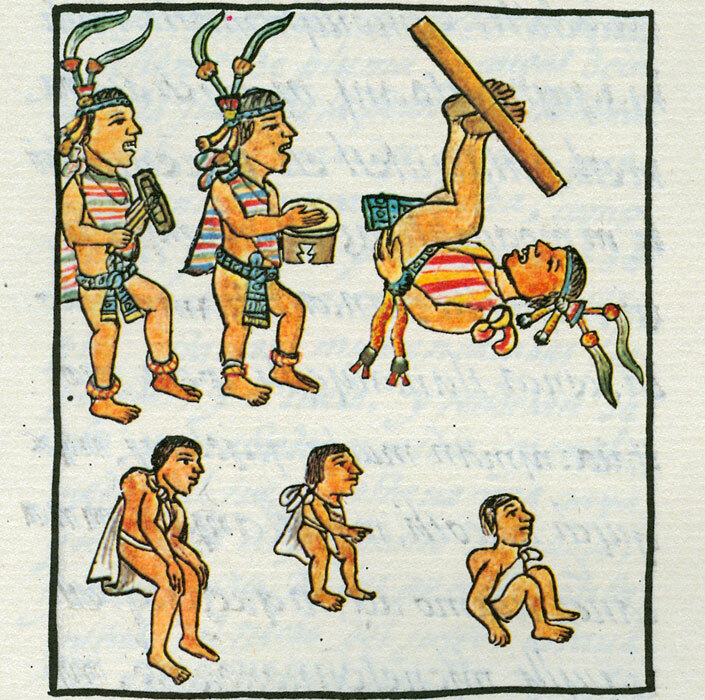 • teponaztontli, tecomapiloa - Small slit-drums, which were provided with a hanging gourd as additional resonator and carried in processions with a strap. • oyoalli, tzitzilli, coyolli - Rows of gold and copper alloy bells, with or without hemispheric clappers. • tlatlapanca, chililitli - Metal plates and gongs struck with mallets. • tehuehuetl - Lithophones made from volcanic stone slabs beaten with stone spheres. Like the slit-drums, these instruments rested on a ring. • yoyotl - Rattles made from dried seed pods. • cuechtli, cuechcochcacalachtli - Row rattles composed of conch tinkles. 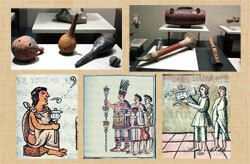 • cacalachtli - Different types of ceramic rattles. • ayacachtli, ayacachicahuaztli - Gourd rattles. • chicahuaztli, ayauhchicahuaztli, ayauhquahuitl, nahualquahuitl - Wooden rattle sticks with box-shaped resonators. • omichicahuaztli - Bone rasps made of human femurs and deer shoulder blades with vertical incisions, scraped with a shell above a skull resonator. • ayotl, ayocacallotl - Turtle shells beaten with deer antlers. Like the slit-drums, these instruments rested on a ring. • tecciztli, quiquiztli, cocolli - Marine shell trumpets. • acatecciztli, atecocolli - Cylindrical trumpets made of ceramics and vegetable material. • acapitztli - Reed flutes. • topitz - Bone flutes. 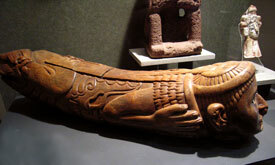 • tlapitzalli, tlapitzayaxochimecatl - Ceramic tubular duct flutes with four fingerholes. • chalchiuhtlapitzalli - Tubular flutes made from greenstone, usually jadeite and green marble. 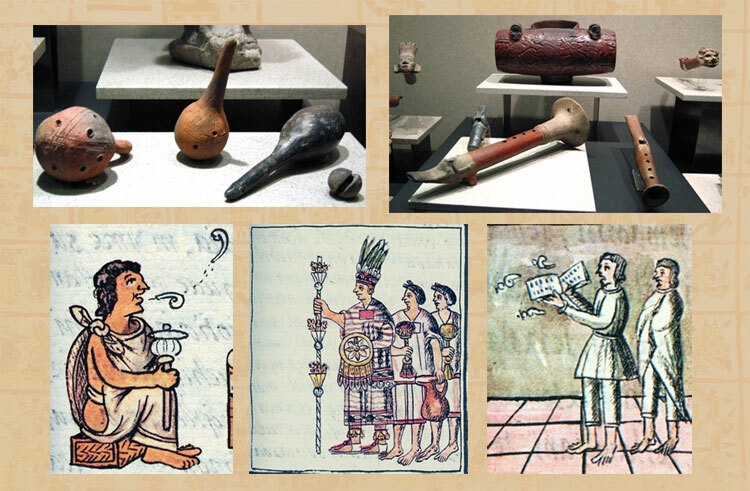 • huilacapitztli, zozohuilotl, zozoloctli, quauhtotopotli, quauhtlapitzalli, tecciztotontli, chichtli - Many different types of ceramic globular flutes and whistles. Noteworthy are the skull whistles, which belong to the so-called air-spring whistles. Their elaborate acoustical mechanism produces a distorted sound reminding of the atmospheric noise generated by the wind. Mexicolore replies: Many thanks, Chris - fascinating! Mexicolore replies: We’ve been planning on preparing a feature on the ayotl for some time: we’ll get there soon, hopefully. You don’t exactly ‘make’ an ayotl - you just need to wait for an elderly tortoise or turtle to die, and there you are....! We take one to schools every day; we got him in Mexico many years ago. He’s been playing to kids for over 30 years! First port of call for info would be Robert Stevenson’s book Music in Aztec & Inca Territory (1968): it contains two or three highly informative pages about the instrument. Hello Jessica, your question is a very good one indeed. 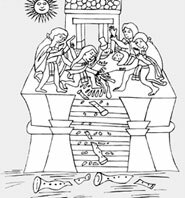 It seems (i am not sure) the catholic church made some kind of private agreement with all mexican and latinamerican indians in the 16th century, that they could continue their dancing prehispanic traditions only as an offering to the new catholic religion. This is something very important, maybe somebody will either confirm or deny this. Hello Ian. Leg Rattles “Mexica” danzantes wear are generally called “Chalchayotes”. They are also used on hand held rarttles. Mexicolore replies: This is all really good info, Martin, very many thanks for sharing it. It clearly comes ‘from the chalk face’ as we say, which makes it so valuable. Keep up the good work! Otra cosita, Huilakapiztli, se refiere usualmente a la “ocarina”. Gracias tambien por la oportunidad dejar mi comentarios aca! Ian write me an email please, I’d like to talk with you, it’s been awhile. I’ve been swamped with performances, instruments making workshop, lectures and even working in new areas with our instruments. You can also visit MEXIKA at www.facebook.com/mexika friends feel free to write to me as well, I’ve been a scholar in this music of my ancestors since 1975. Hope to hear from you soon Ian! very informative, I’ve been hanging out with Danzantes in central mexico for 20 years and I’ve always heard them call the conch shell, atecocoli. You state it’s Cocolli, wow. Mexicolore replies: We believe ‘cocolli’ to be the generic term for conch trumpet and ‘atecocolli’ the term for a long cylindrical ceramic or gourd trumpet. Mexicolore replies: Thanks, Martin. We think you’re doing a grand job over in California: we’d love to see/hear you play live one day...! We recommend your web page (Mexika run workshops with children as well as giving public concerts).